The world's reputedly third oldest church, the Byzantine Başmelekler Church, or Taksiyarhon Church, was purchased by the Istanbul patriarchate on Sept. 10, the head priest of Halki Seminary, Professor Elpidophoros Lambriniadis, has announced. 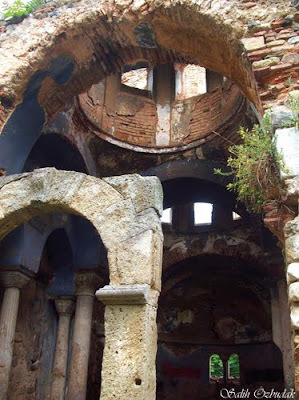 The Başmelekler Church, built in 789 by Byzantine Emperor Constantine Porphyrogennetos, is located in the Trilye region of the Marmara province of Bursa. The church was put up for sale by its owner Teksen Construction for $400,000 back in 2007. Lambriniadis told Anatolia news agency that the Patriarchate completed the purchase of the "Church of the Archangels Michael and Gabriel" on Sept. 10 and that the church was no longer derelict. 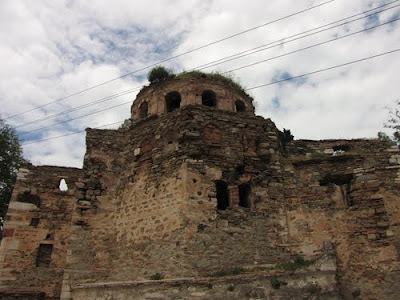 The patriarchate had the church, which lies in ruins, surrounded with a fence and a gate. "There are three keys to the gate," Lambriniadis said. "We hold two of the keys and gave the Kumyaka village the remaining key so that those who wish to visit the church would not be turned away." Lambriniadis said they planned to restore the church, which was part of "the common heritage of Turkey," in the shortest amount of time possible. 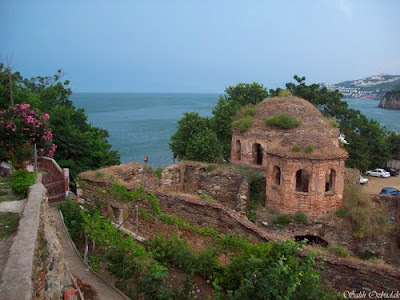 "We wish to restore this historical structure to its past glory so that it can take its place among the other wonderful historical buildings that adorn our city of Bursa," he said. The church still has vaults situated on four walls and an ascending dome, a plan that has been used since early Christianity. Two other examples of this plan also existed in Istanbul, according to reports. Mudanya'nın Tirilye Beldesi'ni ziyaret eden Yunanistan'ın Halkidi Bölgesi'ndeki kardeş şehri Nea Moudania'dan gelen 75 kişilik grup, Heybeliada Ruhban Okulu'nun başrahibi Bursa Metropoliti Prof. Dr. Elpidophoros Lambiriniadis eşliğinde Kumyaka Köyü'ndeki metruk haldeki Taksiyarhon Kilisesi'nde Meryem Ana Duası yaptı.